The Homepage is the first page you will come to when you click onto Fourerr. 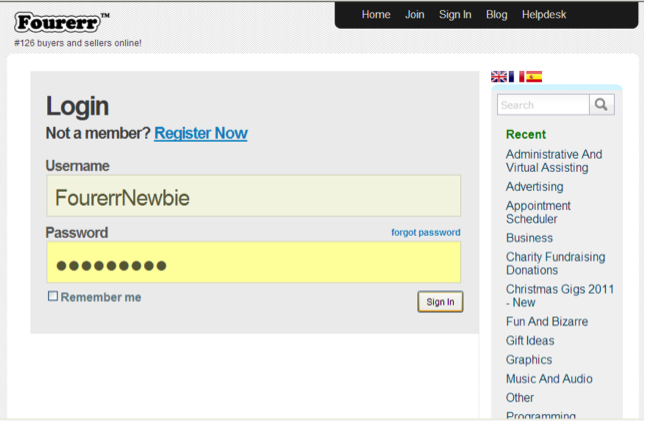 To join Fourerr or Sign In to access more of the site, click on the “Join” or “Sign In” and enter your login details. Home – Homepage where you can view other people’s gigs and sort them by popularity or rating. You can also view gigs in certain categories. Inbox – Contact other sellers and buyers by sending and receiving messages. Profile – Create a profile that tells the Fourerr community who you are and what you do. Seller – A place to create gigs, view and edit our gigs, manage sales, track revenues and view purchases. Buyer – A place to view your orders and check what you have paid for. Helpdesk – A support platform to help you deal with any issues on Fourerr. If you have come to Fourerr to make money, creating a gig is the best place to start. Once you have completed your profile, click on “Create a Gig” on the tool bar at the top of the page or simply write in the box on the Homepage which says: What are you willing to do for money? “I will _______________”. After you have entered what you are willing to do for $4, click “Go” and our gig will have its title. You will go straight to a green page where you select your gig’s category, and whether you want it to be Featured (this costs $5 and means your gig appears at the top of the homepage for 30 days). Next, enter your gig Description – try and be detailed about what you are offering. Next, enter your Tags. 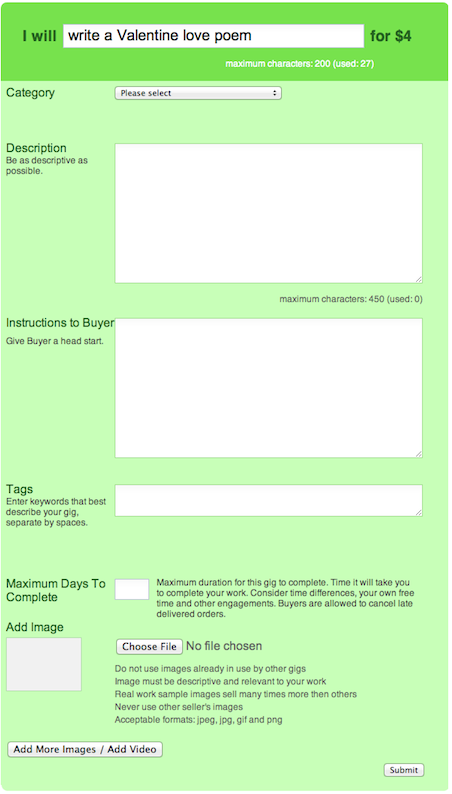 These are the keywords that will make searching for your gig a lot easier for buyers. Ensure that they describe your gig, are relevant and are spelt correctly. After this, you need to let your potential buyer know how long it will take you to complete your gig – make sure that you allow for other work you have on and be as realistic as you can with your time estimate – late gigs could mean that you have lost a potential customer. Finally, add an image to your gig. Click the “Browse” button to upload a picture you have on your computer of a sample of your work – this gives buyers a chance to decide if they want to buy your gig or not. Click “Submit” and your first gig is ready for approval! Note: Feel free to leave a comment on this post and share your knowledge with our members. Fourerr is always best for me and a great site to earn money.